where represents the number of cores per unit mass interval. Many observation indicate that as Table 1.1. Table 1.1: Mass spectrum indicies derived with molecular line surveys. Figure 1.27: Cumulative mass distribution of the 70 pre-stellar condensations of NGC 2068/2071. The dotted and dashed lines are power-laws corresponding to the mass spectrum of CO clumps (Kramer et al. 1996) and to the IMF of Salpeter (1955), respectively. Taken from Fig.3 of Motte et al (2001). 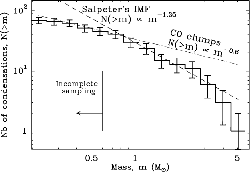 Figure 1.27 (Motte et al 2001) shows the cumulative mass spectrum ( vs. ) of the 70 starless condensations identified in NGC 2068/2071. The mass spectrum for the 30 condensations of the NGC 2068 sub-region is very similar in shape. The best-fit power-law is above . That is, . This power derived from the dust thermal emission is different from that derived by the radio molecular emission lines. The power which is close to the Salpeter's IMF for new born stars, might be meaningful. The reason of the difference is not clear. For example, Tothill et al. (2002) observed the Lagoon nebula around the edge of the HII region M8. From the continum emission , they obtained index of , which is consistent with other molecular line studies.